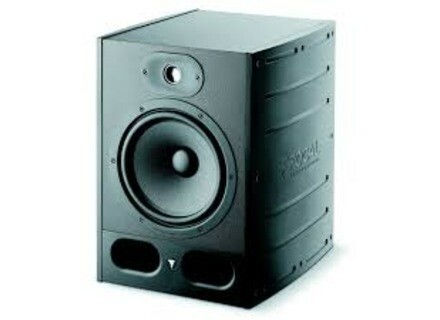 Alpha 80, Active Monitor from Focal in the Alpha series. Since April 2015 they're in my homestudio set, I've been discovering them progressively since then and I guess they certainly need an extra breaking time, still they're already really good. Great for mixing, I finally can distinctly hear my reverbs' depth and the musical stage is incredibly precise. Spaced by 1.3m (a little over 50 in) in a zone with Auralex phonic isolation foam. Now, let's not get mistaken: the sound of a speaker depends a lot on the room's acoustical properties and to take full advantage of it nothing compares with a precise metering and compensation system such as Ik multimedia's Arc 2, and suddenly everything starts making sense. Magical! They rest horizontally on Isoacoustics stands. The lows are punchy and don't drowl (if you hear otherwise then have your room treated for your listening spot is exactly at the worst place). 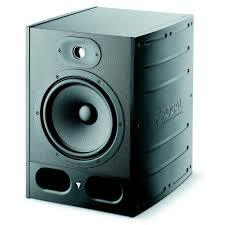 Its power allows to listen at a small volume with a high level of details, while pushing it produces a huge sound (my house resounds at 50 Hz...). A test using daft punk's latest release, a Bob Marley or Rage Against the Machine will achieve convincing you, if need be. Caution: they're heavy and take a lot of space on a 1.8m (6ft) wide desk, I have just enough space left fot two 27" screens and the speakers. Overall, it comes with a huge value for money ratio that allows doing without a sub (hence less to spend), and accessing the Focal range with a precise, almost surgical sound full of air that makes mixing easier. On a side note, no listening fatigue to be noticed on long sessions. Still, the plastic structure seems fragile and sensible to scratches. No protection grill on it. Use Arc 2 within your favorite DAW (remember to bypass it for rendering) and use Foobar 2000 + the asio George young's Vst wrapper addon. You won't believe your ears, which in return will thank you. As a bonus, the included measuring mic is great when used to record a guitar or voice. Other solutions are the freeware mathaudio room EQ (http://mathaudio.com/download.htm) and Sonarworks (21 day trial version, https://sonarworks.com/speakers/ov, but it requires buying a separate measuring mic - that approximates €/$70).